The Big Three was a trip of Major League Baseball starting pitchers for the Oakland Athletics from 2000-2004. The Big Three consisted of Tim Hudson, Mark Mulder, and Barry Zito. Each pitcher in the Big Three was drafted by the Athletics and they played their first couple of years together with the Athletics before splitting up. The Big Three helped the Athletics win three AL West Division titles during their five years together. Tim Hudson was drafted by the Oakland Athletics twice, first in the 35th round of the 1994 NLB Draft and then in the 6th round of the 1997 MLB Draft. Mark Mulder was selected by the Athletics with the #2 overall pick in the 1998 MLB draft. Barry Zito was drafted by the Seattle Mariners in the 59th pick of the 1996 MLB Draft and then again by the Texas Rangers in the round of the 1998 MLB Draft, but he did not sign with either team. Barry Zito would sign with the Athletics after they drafted him with the ninth overall pick of the 1999 MLB Draft. 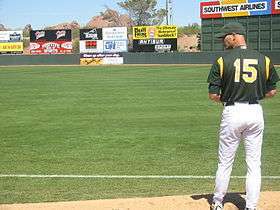 Tim Hudson would make his MLB debut on June 8, 1999, where he would allow three runs in five innings as the Athletics lost to the San Diego Padres 5-3. He would record his first career win in his next start, which would occur on June 13, 1999 against the Los Angeles Dodgers. Tim Hudson would have an 11-2 record in his rookie season and he would finish 5th in voting for the 1999 AL Rookie of the Year Award. Mark Mulder would make his MLB Debut on April 18, 2000, at 22 years of age and having played less than two years in the minors. Mark Mudler had a rough rookie season, as he 9-10 with a 5.44 ERA in his rookie year. Barry Zito would make his MLB debut on July 22, 2000, and he would allow just one run in five innings in a victory over the Anaheim Angels, thus marking the beginning of the "Big Three" era. Barry Zito would have a successful rookie season as he had a 7-4 record and a 2.72 ERA in 14 starts and like Hudson, he would finish 5th in voting for the 2000 AL Rookie of the Year Award. Led by an AL-high 20-wins from Tim Hudson, the "Big Three" led the Oakland Athletics to an AL West Division Title in their first season together. The Athletics would end up splitting the first two games of the ALDS with the New York Yankees, and then Tim Hudson would make his postseason debut in Game 3 of the 2000 ALDS. Tim Hudson would pitch a full wight innings in his postseason debut and allow four runs as the A's would fall to the Yankees 4-2 in Hudson's postseason debut. Barry Zito would make his postseason debut in Game 4 of the ALDS, as he would allow only one run in 5.2 innings to lead the Athletics to an 11-1 win in Game 4 to force a deciding Game 5 back in Oakland. The A's would then lose Game 5 7-5 and would then be eliminated from the postseason. The next season, Mark Mulder would have an AL-leading 21 wins to lead the "Big Three" and the Oakland Athletics into the postseason as a wild card. Mark Mulder would make his postseason debut in Game 1 of the ALDS against the Yankees. Milke Mulder would have a strong postseason debut as he allowed only one run in 6.2 innings to lad the A's to a 5-3 win over the Yankees in Game 1 of the ALDS. Tim Hudson would take the mound for Game 2 and he would pitch eight scoreless innings to lead the A's to a 2-0 win in Game 2 to put the A's ahlead 2-0 heading home and to earn his first career postseason win. Barry Zito would take the mound in Game 3 and would attempt to finish off a sweep against the Yankees, and he would give up only one run in eight innings in his attempt to do so, however, the A's lost the game 1-0. The A's would lose Game 4 9-2, which would mean that it would take a fifth game to decide the series. Mark Mulder would take the mound for Game 5 and would attempt to advance to the ALCS, but his attempt did not go very well as he allowed four runs in 4.1 innings as the A's would lose Game 5 5-3 and would then be eliminated in the ALDS by the Yankees for the second consecutive year. Barry Zito would lead the "Big Three" and the Athletics the following year with an AL-leading 23 wins, a 2.75 ERA, and 182 strikeouts, and he would win the 2002 AL Cy Young Award and lead the A's to an AL West Division title. Tim Hudson would take the mound for Game 1 of the ALDS against the Minnesota Twins and it would not go well for him as after the A's would jump out to a 5-1 lead after two innings, Tim Hudson would give up three more runs in the next 3.1 innings and would be pulled out after 5.1 innings, as the A's lost the game 7-5. Mark Mulder would take the mound for Game 2 and he would have a strong outing, only giving up one run in six innings to lead the A's to a 9-1 win over the Twins in Game 2. Barry Zito would take the mound for Game 3 and he would go six innings giving up three runs to lead the A's to a 6-3 win over the Twins. Tim Hudson would take the mound again in Game 4 and it would not go well for him as he would give up seven runs in just 3.1 innings and the A's would get blown out by the Twins 11-2. Mark Mudler would take the mound again for the A's in the fifth and deciding game of the ALDS and would attempt to send the A's to the ALCS, and this time, he would give up just two runs in seven innings, but the A's would lose the Game 5-4 and would be eliminated in the ALDS for the third consecutive year. The "Big Three" were able to lift the A's to an AL West title in 2003, earning them their fourth consecutive postseason appearance. However, Mark Mulder was unable to pitch in the postseason due to injury. Tim Hudson would get things started by going 6.2 innings allowing three runs in Game 1 of the 2003 ALDS, as the A's would beat the Boston Red Sox 5-4. Barry Zito would have a strong outing for the A's in Game 2 of the ALDS as he gave up only one run in seven innings to lead the A's to a 5-1 win over the Red Sox to put them ahead 2-0 leading to Boston. The A's would end up losing Game 3 3-1 in 11 innings. Tim Hudson would exit Game 4 after just one inning due to a strained left oblique, and the A's would end up losing Game 4 5-4. Barry Zito would take the mound for Game 5 and would attempt to send the A's to the ALCS after three consecutive ALDS-Game 5 losses, but after pitching five scoreless innings, he would give up four runs in the sixth inning as the A's would lose the Game 4-3 and would then be eliminated after losing Game 5 of the ALDS for the fourth consecutive year. The following year, Tim Hudson's season would be cut short due to an injury and that would prove to be costly for the A's as they finished second in the AL West and would miss the playoffs for the first time since 1999. After the 2004 season, Oakland Athletics general manager Billy Beane shocked many people with two bizarre trades which broke up the "Big Three", as he traded Tim Hudson to the Atlanta Braves and he traded Mark Mulder to the St. Louis Cardinals just when they were getting to the primes of their career. Tim Hudson would spend nine season with the Atlanta Braves before playing his final two seasons for the San Francisco Giants, with whom he would win the 2014 World Series. 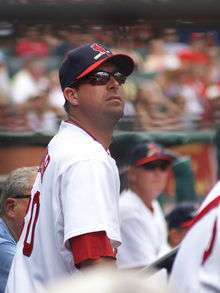 Mark Mulder would spend four seasons with the St. Louis Cardinals, after which he would be released from the Cardinals after suffering from rotator cuff and other shoulder problems during his time with the Cardinals and after remaining unsigned fur a year and a half, he would announce his retirement on June 15, 2010 by saying "I guess I have retired." Barry Zito would spend two more seasons with the A's after they traded Mulder and Hudson. In the 2006 season, Barry Zito would have a 16-10 record, a 3.83 ERA, and 151 strikeouts to help lead the Athletics to an AL West Title. Barry Zito would have a throng outing for the A's in Game 1 of the ALDS as he would only give up one run in eight innings to lead the A's to a 3-2 win over the Minnesota Twins in Game 1. The A's would end up winning the next two games to sweep the Twins and advance to the ALCS for the first time since 1992, also winning their first postseason series since 1990. 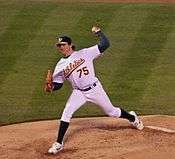 Barry Zito would take the mound for Game 1 of the ALCS against the Detroit Tigers, but it would not go well for him as he gave up five runs in 3.2 innings as the A's fell to the Tigers 5-1. The A's would end up losing the next three games and would end up getting swept by the Tigers in the ALCS. After the 2006 season, Barry Zito would sign with the San Francisco Giants, and would play seven seasons with the Giants and after taking a year off from baseball in 2014, Barry Zito spent one last season with the Oakland A's Triple-A Affiliate, Nashville Sounds. After that season, Barry Zito would announce his retirement from baseball. ↑ "Tim Hudson Statistics". Baseball-Reference. Retrieved July 29, 2016. ↑ "Mark Mulder Statistics". Baseball-Reference. Retrieved July 29, 2016. ↑ "July 22, 2000 Anaheim Angels at Oakland Athletics". Baseball-Reference.com. Retrieved July 29, 2016. 1 2 3 "Barry Zito Statistics". Baseball-Reference. Retrieved July 29, 2016. ↑ "2000 ALDS – Oakland Athletics vs. New York Yankees – Game 3". Retrosheet. Retrieved July 29, 2016. ↑ "2000 ALDS – Oakland Athletics vs. New York Yankees – Game 4". Retrosheet. Retrieved July 29, 2016. ↑ "2001 ALDS – Oakland Athletics vs. New York Yankees – Game 1". Retrosheet. Retrieved July 29, 2016. ↑ "2001 ALDS – Oakland Athletics vs. New York Yankees – Game 2". Retrosheet. Retrieved July 29, 2016. ↑ "2001 ALDS – New York Yankees vs. Oakland Athletics – Game 3". Retrosheet. Retrieved July 29, 2016. ↑ "2001 ALDS – Oakland Athletics vs. New York Yankees – Game 5". Retrosheet. Retrieved July 29, 2016. ↑ "2002 ALDS – Minnesota Twins vs. Oakland Athletics – Game 1". Retrosheet. Retrieved July 29, 2016. ↑ "2002 ALDS – Minnesota Twins vs. Oakland Athletics – Game 2". Retrosheet. Retrieved July 29, 2016. ↑ "2002 ALDS – Oakland Athletics vs. Minnesota Twins – Game 3". Retrosheet. Retrieved July 29, 2016. ↑ "2002 ALDS – Oakland Athletics vs. Minnesota Twins – Game 4". Retrosheet. Retrieved July 29, 2016. ↑ "2002 ALDS – Minnesota Twins vs. Oakland Athletics – Game 5". Retrosheet. Retrieved July 29, 2016. ↑ "2003 ALDS – Boston Red Sox vs. Oakland Athletics – Game 1". Retrosheet. Retrieved July 29, 2016. ↑ "2003 ALDS – Boston Red Sox vs. Oakland Athletics – Game 2". Retrosheet. Retrieved July 29, 2016. ↑ "2003 ALDS – Boston Red Sox vs. Oakland Athletics – Game 5". Retrosheet. Retrieved July 29, 2016. ↑ "Atlanta Acquires All-Star pitcher Tim Hudson". MLB.com. December 16, 2004. Retrieved July 29, 2016. ↑ "A's trade Mulder to Cardinals for Haren, Calero". Sports Illustrated. December 18, 2004. Retrieved July 29, 2016. ↑ Boeck, Scott (June 15, 2010). "Mark Mulder Says He's Retired; Now Playing Competitive Golf". USA Today. Retrieved June 15, 2010. ↑ "2006 ALDS – Oakland Athletics vs. Minnesota Twins – Game 1". Retrosheet. Retrieved September 13, 2009. ↑ "2006 ALCS Game 1 – Detroit Tigers vs. Oakland Athletics". Retrosheet. Retrieved September 13, 2009. ↑ "Zito passes physical, making $126 million deal official". ESPN.com. Associated Press. December 30, 2006. Retrieved July 19, 2009. ↑ McCauley, Janie (April 4, 2015). "Left-hander Barry Zito takes his comeback bid to Triple-A Nashville in Athletics system". U.S. News & World Report. Associated Press. Retrieved April 6, 2015. ↑ Zito, Barry (October 19, 2015). "What Baseball Taught Me". theplayerstribune.com. Retrieved October 19, 2015.